South Shore reader Dorothy Hajioannou kindly brought in her family albums of photographs into The Gazette office, giving a very personal glimpse into life in the last century. The pictures range from her mum and dad’s wedding, to family holidays as children and the guests at her grandparents’ hotel in Alexandra Road, Blackpool. 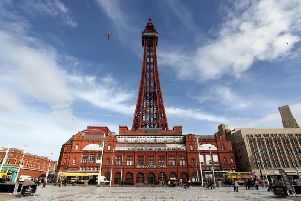 Dorothy’s grandmother, Alice Rooney, moved to Blackpool with her husband James after he was left disabled from fighting in the First World War. He had been given just three months to live but was told the best place to be would be by the sea. Alice had seen a house for sale in Blackpool, so she bought it and the couple moved to the resort in October 1921. Dorothy said: “They doctor had said to my grandmother to take my grandfather to the beach and walk along the water’s edge, so she did that religiously four times a day. He lived for three years, when he had been given three months. “My grandma used to love to go to auctions and she always had a pencil behind her ear. “One day she was at an auction and was talking to the person next to her, when she dropped the pencil. As she bent down to pick it up off the floor, the auctioneer took that as her bid and she ended up buying that side of the hotel. It was half of two Gothic villas. Dorothy’s father Charles was originally from Cyprus. Dorothy, now 67, said: “My dad was based at Weeton and he would come and cut the recruits’ hair. They would stay for the night, get their papers and the next day they were off.